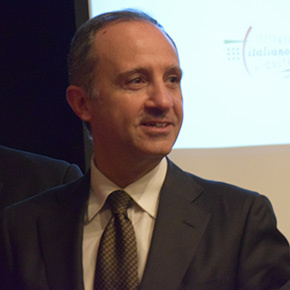 On the occasion of the Columbus Day celebrations, Sebastiano Fulci, the Permanent Observer of Italy to the Organization of American States (OAS), joined by Andrea Claudio Galluzzo, President of the Association Fiorentini nel Mondo, Joseph Sciame Chair of the Conference of Presidents of Major Italian American Organizations, John Viola Chief Operating Officer of The National Italian American Foundation, Justice Dominic Massaro of the Supreme Court of New York, donated on behalf of Italy, a bust of the Florentine navigator and cartographer, Amerigo Vespucci, a work by the American artist Greg Wyatt. 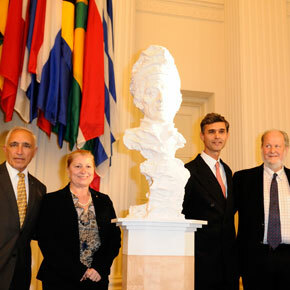 During the ceremony, held in Washington, D.C. on October 11, 2012, Fulci, said that the donation was an “homage to the five hundredth anniversary of the death of the Italian navigator” who gave his name to the continent, and is part of the celebration of “the discovery of America,” which the OAS commemorated on October 12. Present at the ceremony, held in the Hall of the Americas at OAS headquarters, were also the Secretary General of the OAS, José Miguel Insulza, the Assistant Secretary General, Ambassador Albert Ramdin, and the Chair of the Permanent Council and Permanent Representative of Mexico, Ambassador Joel Antonio Hernández García, among others. Amerigo Vespucci was born and raised in Florence, acquired the favor and protection of Lorenzo de Medici. In 1499 he joined Alonso de Ojeda, who had received from Spain the task of exploring, the south coast of the “region” discovered by Columbus. Navigator of the seas and profound scholar, during his travels he explored much of the eastern coast of South America. 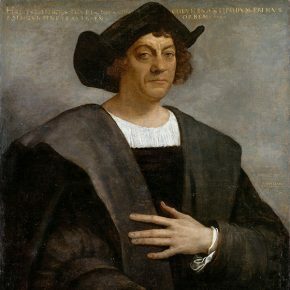 He was among the first supporters of the idea that Christopher Columbus had discovered a new continent and not a western route to reach the Far East by sea. In his letters and diaries Amerigo Vespucci described the mainland as a “New World” and was the first to realize the presence of a new continent. In fact in his letters, addressed to Lorenzo de ‘Medici, Vespucci describes in detail the new territories, the peoples and animals understanding that this land couldn’t be the Asian continent. It was the rapid spread of the letters circulated under his name that suggested the cartographer Martin Waldseemüller to use the female gender (America) of his Latinized name (Americus Vespucius), to indicate the new continent in his world map drawn in 1507.